I don’t hate Charlie Huston, but I will admit to having snarled his name out loud more than once while reading Skinner. It’s a stunning piece of work, even for Huston whose output is relentlessly good, but there are bits of absolute genius in it that spike my writer’s jealousy like few other things I’ve read. Absolute mastery of pacing. Evocative, descriptive turns of phrase that convey reams of information in a single jolt. Lean, muscular confrontations whose nascent violence is more visceral than other people’s epic brawls. It’s just one brilliant thing after another with this jerk, all book long. That said, even my Huston-induced pangs of self-doubt couldn’t blunt my enjoyment of this book. Skinner founded his career in “asset protection” on fear. To touch anyone under his protection was to invite destruction. A savagely effective methodology, until Skinner’s CIA handlers began to fear him as much as his enemies did and banished him to the hinterlands of the intelligence community. Now, an ornate and evolving cyber-terrorist attack is about to end that long exile. His asset is Jae, a roboticist with a gift for seeing the underlying systems violently shaping a new era of global guerrilla warfare. At the root of it all is a young boy, the innocent seed of a plot grown in the slums of Mumbai. Brought to flower, that plot will tip the balance of world power in a perilous new direction. 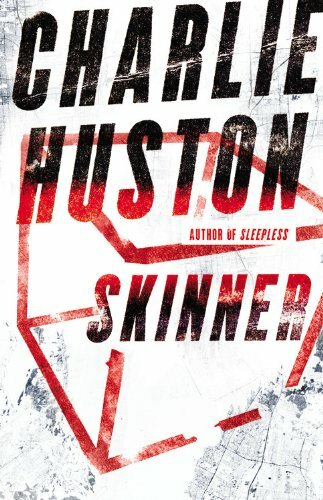 A combination of Le Carre spycraft with Stephenson techno-philosophy from the novelist hailed by the Washington Post as “the voice of twenty-first century crime fiction,” SKINNER is Charlie Huston’s masterpiece–a new kind of thriller for a new kind of world. There’s a perverse kind of synchronicity in the timing of Skinner’s release with Edward Snowden’s recent revelations that serves to underscore how eerily accurate Huston’s portrayal of the intelligence community’s underbelly really is. Skinner’s world is not only plausible, but probable, in everything but the particular circumstances and scale. And based on the news recently, I may be wrong to doubt the scale. Amazingly, the characters remain front and center despite this vivid and frightening backdrop. Skinner himself is a perfectly balanced blend of monster and victim and hero, effortless to root for and fear at the same time. Jae, who is as much of a protagonist as Skinner, is equally complex and compelling. Her tortured genius is executed with a deft hand, never becoming contrived or maudlin. Together they produce a dynamic tension that’s marvelous to watch, like two pieces of broken glass from different windows that happen to fit together perfectly. It would have been easy for lesser characters to have become subsumed in a story like this, but it’s never a possibility here. Bottom line, it’s probably Huston’s best work to date, edging out even The Shotgun Rule and The Mystic Arts of Erasing All Signs of Death. I know, bold statement. But I stand by it. A long time ago, back in the before-times of 2008, bon vivant and author-around-town John Scalzi issued a challenge to authors to post their one-star reviews. Many did, and as you can imagine, hilarity ensued. As I read this I was reminded of some books from the 50s and 60s. It was superficial, the characters had outlandish powers, the guys – to a man (there were no female ‘bad guys) – were nasty, had massive protective body gear, and were easily beaten by unusually intelligent amateurs. Untested space technology allowed them to build huge ‘flying saucers’ in order to fly off to create a new human colony on some planet far away. Give me a break! I have to say, the bit about space technology and flying saucers really spoke to me. While a less astute, and dare I say it, a more pedantic person might point out boorishly that there aren’t any spaceships, other planets, or colonies of any kind in the book, I would urge that person to open his mind and not be such a downer. I think anyone that constrains themselves to the actual text of a book is only seeing a small slice of the truth. I guess how small depends on how much extra stuff you make up, but that’s not the point. The point is that any book can have as many spaceships as you want, if you can only open your heart to the possibility. That’s the real beauty of reading. Uh, or not reading. Whatever. I guess what I’m trying to say is that I’m deeply, truly sorry for screwing up the spaceships that weren’t in the book. I promise it won’t happen again.